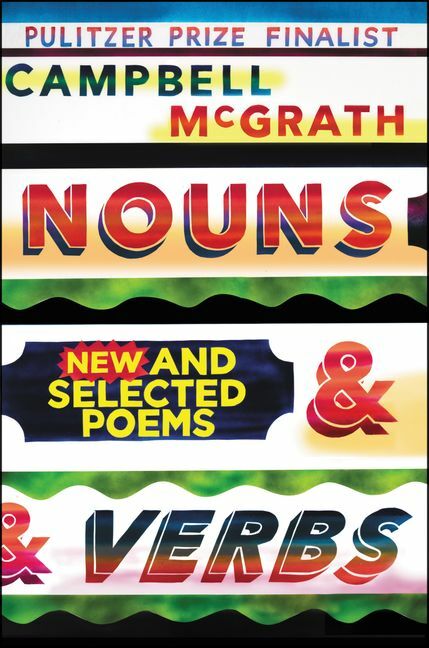 Deeply personal but also expansive in its imaginative scope, Nouns & Verbs brings together thirty-five years of writing from Campbell McGrath, one of America's most highly lauded poets. Offering a hint of where he's headed while charting the territory already explored, McGrath gives us startlingly inventive new poems while surveying his previous work-lyric poems, prose poems, and a searing episodic personal epic, “An Odyssey of Appetite,” exploring America's limitless material and spiritual hungers. Nothing is too large or small to remain untouched by McGrath's voracious intellect and deep empathy-everything from Japanese eggplant to a can of Schaefer beer to the smokestacks of Chicago comes in for a close and perceptive look even as McGrath crosses borders and boundaries, investigating the enduring human experiences of love and loss. Campbell McGrath’s previous collections are Capitalism, American Noise, Spring Comes to Chicago, Road Atlas, Florida Poems, and Pax Atomica. His awards include the Kingsley Tufts Prize and fellowships from the Guggenheim and MacArthur Foundations. He teaches in the creative writing program at Florida International University in Miami.